You wouldn’t find these windows at your local Home Depot Window and Sliding department; it’s made of a translucent OLED panel by the Korean Electronics Giant, Samsung. 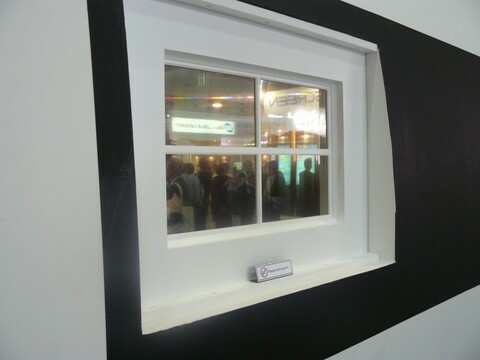 The company has showcased a prototype of four 12.1-inch OLED panels as a window display at FPD International 2008; it’s also its first exhibition of OLED panel with a transmittance of 30 percent at Japan. Each panel has a resolution of 840×504 and is capable of 200cd/m2 luminance, extremely fast 0.01 ms panel response rate, and can achieve 100% coverage of NTSC color gamut. Nikkei said the manufacturer has declined to disclose the technicality behind the four panes of glass. But like the flapping 0.05mm OLED panel, the drive element was formed by a low temperature polysilicon TFTs and “The device structure is a top emission type, and organic EL materials for RBG colors are separately applied by using a metal mask”. The Quake-Catcher Network is a collaborative initiative for developing the world’s largest, low-cost strong-motion seismic network by utilizing sensors in and attached to internet-connected computers. 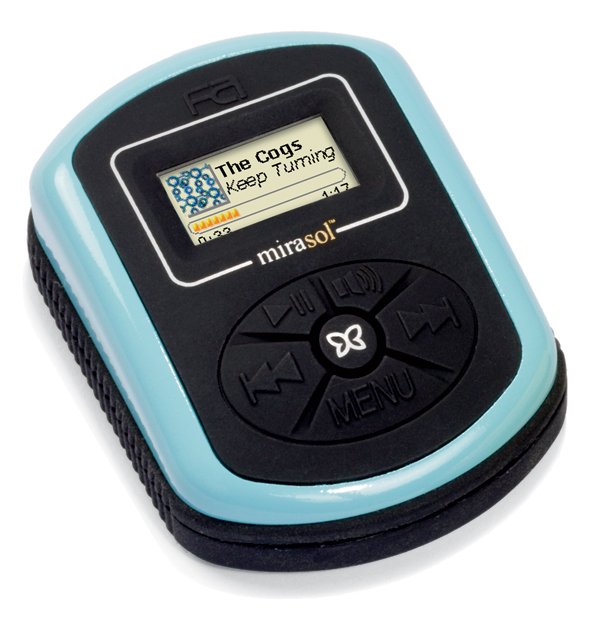 A waterproof MP3 player built for bright beach days is the first device with a color "e-paper" display, meaning it has no backlighting and thus can be read in direct sunlight. The display, from Qualcomm, consists of two layers of a reflective material. Some wavelengths of light bounce off the first layer; some pass through and bounce off the second. Interference between the two beams creates the color, and electrostatic forces control the distance between the layers. Google's Rich Miner thinks Android will bring more people to the mobile Web. There's a lot of talk at Mobile Internet World 2008, in Boston, about how great applications for mobile devices die all the time because it's so hard to get through all the negotiation that stands in the way of real people using the software. A startup often has to work deals with carriers, device manufacturers, and the company that controls a device's operating system before having any hope that people might one day be able to buy or use any software that the company intends to build. But while insider woes may not matter to the average person, the goals described by Rich Miner, group manager of mobile platforms for Google and one of the visionaries behind the company's open Android platform, could vastly change how large numbers of people access the Internet--if Android succeeds. Google is supporting Android for a long-term reason, Miner said. The company's products are all Web services, and, after having successfully won the hearts and minds of many people using laptops and desktops, one way the company hopes to grow is by convincing more users to access its services through mobile phones. That requires making it possible for them to do so. Miner described Google's frustrations building a Maps application for mobile phones. Miner said that after having established itself by building on open-source software in most cases--using the Linux operating system, for example--the company was shocked at the closed, serpentine processes typical of building mobile applications. The company wants to change what is now often an expensive, 18-month process into a matter of days and a $25 application fee. The company has successfully pushed industry giants to talk the same talk. Yesterday at the conference, Verizon Wireless director of open development Anthony Lewis spoke about his company's efforts to reduce the application approval process to only four weeks. If these types of efforts succeed, people will see many more applications available through mobile phones. It will be easier to access Web pages and services familiar from the larger Internet, and devices will stop existing as separate animals. And presumably, Google will continue to rake in money through advertisements as more people access the Internet more often. The vision that Miner described is in line with other things that I've heard from Google, particularly in relation to App Engine, its quick-start service designed to help Web application developers get going quickly and easily. The idea is that the easier it is for people to build software for the Web, the more reasons people will have to access the Web. The Web will become an ever-larger part of people's lives. In the end, this will be good for Google. In service to this strategy, the company has poured money and effort into shaking up the mobile industry. Since the first phone running Android software came out this Tuesday, with many more to follow, it's time for users to put Google's strategy to the test. I'm hoping that Android and other open efforts succeed. Google's profit motives aside, the mobile industry is clearly choked and stifled by the wrangling and politics associated with getting new software and hardware on the market. Breaking that block will bring better services to people using mobile devices. 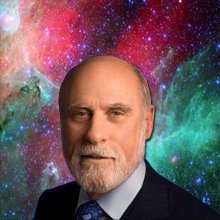 Why Vint Cerf wants to put Internet-style networking in space. Networking space: Vint Cerf, cocreator of the Internet and a vice president at Google, is designing protocols for a robust space-communication network, modeled on the terrestrial Internet. Cerf is working with a team at NASA’s Jet Propulsion Laboratory (where he is also a visiting scientist) and at the MITRE Corporation, based in Washington, DC. Having designed the networking protocols that launched the Internet, Vint Cerf now wants to put the same kind of robust communications network in outer space. Currently, astronauts and robotic spacecraft communicate with Earth using point-to-point radio links and communications schemes that are tailored to nearly every new mission. This inhibits interoperability and the repurposing of communications equipment, and as the number and complexity of missions increases, it will only become more problematic. Cerf, who is Google's vice president and chief Internet evangelist, is working with a team at NASA's Jet Propulsion Laboratory (JPL), where he is also a visiting scientist, and at the MITRE Corporation, based in Washington, DC, to design and implement a revolutionary new scheme for space communication. The project, dubbed the Interplanetary Internet, will be tested aboard the International Space Station (ISS) in 2009, and Cerf hopes that by 2010, new space missions will be designed to use the protocols. Ultimately, the network could interconnect manned and robotic spacecraft, forming the backbone of a communications system that reaches across the solar system. Technology Review's Brittany Sauser caught up with Cerf to discuss the details of the project. Technology Review: What's the purpose of the Interplanetary Internet? Vint Cerf:The project started 10 years ago as an attempt to figure out what kind of technical networking standards would be useful to support interplanetary communication. Bear in mind, we have been flying robotic equipment to the inner and outer planets, asteroids, comets, and such since the 1960s. We have been able to communicate with those robotic devices and with manned missions using point-to-point radio communications. In fact, for many of these missions, we used a dedicated communications system called the Deep Space Network (DSN), built by JPL in 1964. But one problem with space communication has been the limited use of standards. When we launch a spacecraft with a unique set of sensors onboard, we often end up writing special communication and application software that is adapted to that spacecraft's sensor systems and manipulators. In the Internet world, we use standards called the TCP/IP protocol suite--packet switching and store-and-forward methods--to allow a lot of different devices, billions of things, to interact compatibly with each other. The team set out to develop a suite of protocols that would allow us to have the kind of network flexibility in space that we have on Earth. The Interplanetary Internet project is primarily about developing a set of communication standards and technical specifications to support rich networking in space environments. TR:What are the challenges of building such a network in space? VC:We started by working on a set of protocols that could deal with two very important properties of space communication. The first is delay. The distances between the planets are very large. For example, when Earth and Mars are closest together, it still takes 3.5 minutes for a radio signal moving at the speed of light to propagate. If I were on Mars and you were on Earth, it would take seven minutes at best before you heard a response. When Earth and Mars are farthest apart, the round trip takes 40 minutes! The reason we can talk back and forth on Earth so easily is that propagation times are very short by comparison. The other problem is that the planets and their satellites are in motion, and most are rotating. The rotation of the planets means that if you are talking to something that is on the surface of the planet, it may rotate out of the line of sight so you cannot talk to it anymore, until the device on the surface rotates into view again. The same could be said for some orbiting satellites. You have to develop protocols that will deal with the fact that you cannot always communicate with the other party: the communication is both delayed and potentially disrupted. So that is what we designed: a delay- and disruption-tolerant networking system [DTN]. It will allow us to maintain communications more effectively, getting much more data because we don't have to be in direct line of sight with the ultimate recipient in order to transfer data. The new protocols will be proposed to serve as a potential international standard for space networking. TR:How does this new protocol, the delay- and disruption-tolerant networking system, work? VC: We are using store-and-forward methods [routing information through hosts that hold on to it until a communications link can be established] similar to the TCP/IP design in order to service space-communication requirements. But our new bundle protocol is based on DTN principles. We have to cope with the fact that there is a really high potential for delay and disruption in the system. For example, Pluto is a long ways away, on the order of three to five billion miles and about 12 hours round-trip time. Using the DTN bundle protocol allows us to design more-complex mission configurations involving many devices on the surface of planets and in orbit around them. At Mars, for example, there are four orbiters and three landed and operational spacecraft. We expect to be able to use the standard TCP/IP protocols on the surface of planets and inside spacecraft, but we will use the DTN protocols for interplanetary distance communications. TR: Is this going to require putting new infrastructure in space? VC: The answer is yes and no. For example, the Deep Impact spacecraft [now called EPOXI] is already in orbit around the sun. It was used to launch a probe into a comet to examine its interior. EPOXI is being temporarily repurposed to test the new DTN protocols. The spacecraft has processing, memory, radio equipment, and solar panels for power so we don't have to put new hardware up. We just have to upload new software. We are lucky to not have to field any new equipment yet, but the DTN protocols eventually have to show up in a fairly significant number of devices in the system to create the kind of network that can serve space-communication needs. Some specialized spacecraft could become store-and-forward routers. Each time a new mission is launched, using the standard bundle protocol, previous mission assets that are still in operation could be used to support the communication requirements of the new mission. In this way, we hope to accrete a kind of interplanetary backbone network. TR: How are you handling security issues? VC: There are security concerns, and we have been very careful to build defenses into the basic design. Each bundle-aware node will verify the identity of any other nodes that it is communicating with, and it will refuse to forward data from any nodes that it does not recognize. We will be using strong authentication methods, cryptographic communication methods, to ensure that the parties that are using the resources are authorized to do so. TR: What is the biggest advantage of building new protocols for space communication? VC: The important part here is that we have standardized protocols that will allow internetworking of various spacecraft launched by all the spacefaring nations. Over time, as new missions are launched, you start to build up a backbone capability. Every time you put up a new mission, you basically are putting up another potential node in the network. Our hope in the near term is to start putting DTN/bundle-protocol applications up on the Internet terrestrially, and also put them up on the International Space Station for testing. Eventually, we hope to have this capability running all the time, and then, when new deep-space missions are launched using these standard protocols, they will become part of the interplanetary communications system.